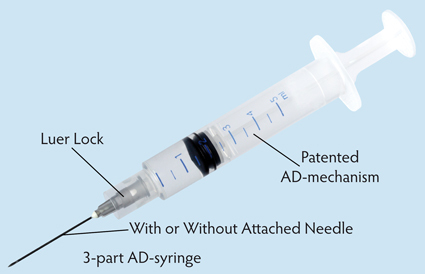 AUSTROPLAN can provide key equipment for the manufacture of the newly developed AD-syringe which has a simple design, close to a standard two part syringe. Therefore it can be used in the same way as a general two part syringe for any health care purpose. 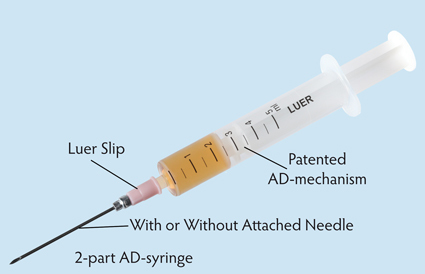 The AD syringe can be executed with slip luer cone, luer lock system and/or permanently attached needle as well as with a ISO colour-coded plunger rod. hepatitis B or HIV) because they cannot be reused. AD syringes are currently the preferred equipment for administering vaccines, both in routine immunization and for general health care. AUSTROPLAN's key equipment ensures the production of AD-syringes in consistent high quality standards in compliance with the current ISO standards and WHO specifications as well as to the Medical Device Directive of European Commis-sion for CE Marking.